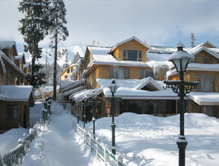 A four star property located in the vicinity to the Gulmarg Ice Skating Rink, the most renowned attraction of Gulmarg. Other must see attractions close by are Maharaja Palace, Gulmarg Gandola and St.Mary Church. The existence of many tourist attractions in proximity makes it the perfect place for leisure and business travelers. The hotel features spacious hall, the living room and coffee bar providing superb spaces for dining, socializing and meetings. There is also a gift shop where you can buy souvenirs for home. All those who desire to engage in various recreational sports activities; Heevan Retreat is the place to be. Accommodation There are 37 well maintained rooms that come with an array of facilities to render the guests with remarkable experience that they will cherish for many, many years. Each of the rooms offers a fascinating sight of the Affarawat peaks. 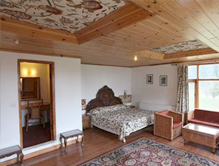 The elegantly designed rooms reflect the rich culture of Kashmir’s art and craft. Satellite TV, room service, laundry service, tea/coffee maker and mini bar are some of the amenities rendered in each room. Dining The hotel has a restaurant called Dilkusha which serves a variety of Indian, Chinese and continental delicacies to gratify the craving of the guests during their stay in Gulmarg.